In the same way that old friends might anticipate yearly reunions, gardeners look forward to seeing their favorite midwest perennials return every year. Purchasing perennials doesn’t just bring comforting regularity to gardeners’ routines; investing in re-blooming plants saves time and money in the long run. It’s simple to get value out of perennials; they also multiply, allowing gardeners to divide their crop and spread flowers to other parts of the yard without spending another dime. Since they bloom for two to three weeks at a time, incorporating perennials with different life cycles into your garden is a great way to ensure that there are plants flowering continuously. Find the right perennials for you by taking a look at these perfect perennials for Midwest gardens. 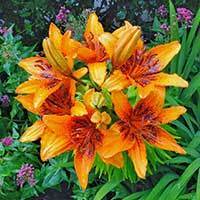 Favored by floral arrangers, Asiatic lilies bloom early and spread quickly. Thankfully, they aren’t difficult to divide and thin. Hybrids are available in white, pinks, vivid yellows, oranges, and reds. One of the easiest types of lily to tend, Asiatics can flourish in full sun to part shade, as well as many different soil conditions. They range from one to six feet tall. In Latin, aqulinum means “eagle-like.” This descriptor is relevant to columbines due to the spurs at the bases of their blossoms; spurs draw butterflies and hummingbirds but repel deer and rabbits. Half-open columbines look lovely in arrangements. Columbines can be found in single colors or combinations of two, including red, yellow, blue, and white. Find a spot for them in full sun to part shade. 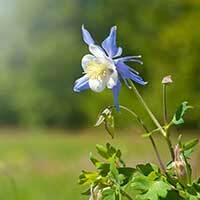 Average but moist, well-drained soil works for columbines, which eventually self-seed. With so many species to choose from, you’re sure to find one that will fit in well with your garden. For instance, Japanese painted ferns, coveted for the white and burgundy in their leaves, are especially resistant to pests and disease. Pleasing greenery that bring texture and dimension to gardens, ferns range in color from silvery white to vibrant lime. 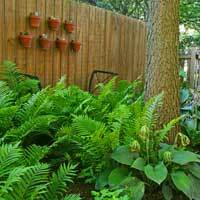 Most ferns prefer shade, where this naturally rich color can be especially welcome. Ferns do best in organic, well-drained soil that’s slightly acidic. Mulching helps retain the correct level of moisture. 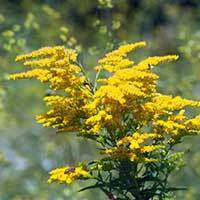 Goldenrod brings warm color to gardens in late summer and autumn. 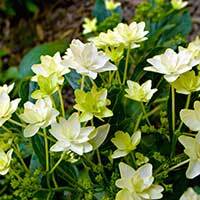 These clump-forming perennials feature fluffy yellow blossoms. Since their nectar is attractive to bees and butterflies, goldenrod encourages insects to pollinate gardens. Clumps should be divided every four to five years. As its hue suggests, this drought-resistant plant needs sunlight, but can survive in a variety of well-drained soil types. Interested in improving your borders? There are many types of geraniums that can do the job, all with mounded foliage and cup-shaped blossoms in common. For example, Biokovo features large scalloped leaves and pale pink blossoms. It also emits an intoxicating scent. Meanwhile, heat and humidity can’t deter Rozanne, one of the longest-blooming varieties of geranium. Many types bloom for a long while, in fact, while others can even self-seed. 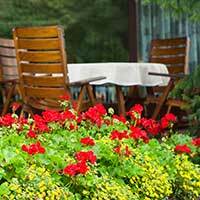 Most prefer sun, but some geraniums can also be planted in part shade. There being two hundred species of iris means that there is type out there for practically any spot in any garden. In general, Irises prefer well-drained soil with a near neutral pH. Spiky foliage creates visual contrast in relation to other plants. 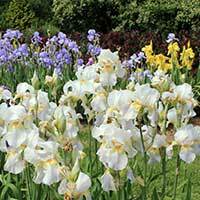 For a focal point, assemble irises in groups of three to seven identical plants. 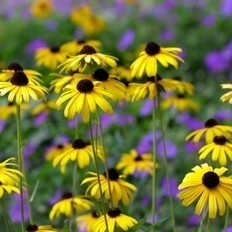 Good weather results in re-blooming in late summer and early fall. To maintain irises, dig them up and divide every few years in the fall. 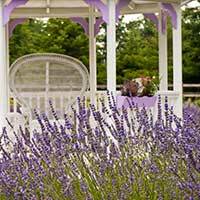 Well-known for its distinctive, relaxing scent, lavender is also a hardy perennial that thrives in the Midwest. Lavender is a particularly multi-faceted plant—use the stems as herbs; dry the blossoms for potpourri, arrangements, and medicinal tea; and extract the oil for aromatherapy. A shrub-like, compact variety, lavender consists of silvery green foliage and slender stalks of blue and purple flowers. Lavender should be exposed to full sun and planted in dry soil; it’s actually very drought-tolerant. Lenten rose is one of the first perennials to bloom every year, even capable of peeking out from beneath the snow. This hardy evergreen comes in varieties of purple, red, near-black, white, green, and pink. In moist rich soil, Lenten roses can grow to twelve inches in height and eighteen inches across as long as they receive enough shade. Full, white, and delicate like clouds, panicle hydrangeas make for ideal hedges, borders, and focal points. Even more ideally, they are strong enough to withstand cold environments. Pinky Winky is one kind of panicle hydrangea that really draws the eye; its cone-shaped flowers shift from white to pink as they age. 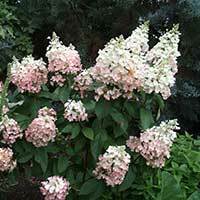 Panicle hydrangeas are large in size, reaching from six to eight feet in height and width. 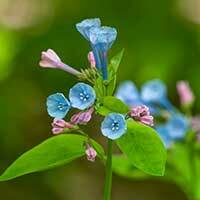 Come spring, Virginia bluebells’ pink buds transform into pink-purple flowers. These plants are very convenient, in that they not only prosper in either sun or shade, but multiply themselves by reseeding. Mature bluebells can be two feet by two feet. Nearby summer flowers can distract from faded bluebells, which begin to wilt in June.